When Princess Joséphine-Charlotte of Belgium married Hereditary Grand Duke Jean of Luxembourg in 1953, she brought a considerable number of jewels with her to her new country, including several wedding gifts. This tiara, the Belgian Scroll, was not only a wedding present but also the tiara that Joséphine-Charlotte chose to wear in some of her wedding portraits. The tiara, which is made of diamonds set in platinum, was made by Henry Coosemans in the same year that Joséphine-Charlotte married. The diamonds were all sourced from the Belgian Congo, which had not yet been granted independence; the same is true for some of the other diamond gifts that Joséphine-Charlotte received. The was given to the princess by the Société Générale, a French bank. The largest central diamond is detachable and can also be worn as a ring. Joséphine-Charlotte’s husband became Grand Duke Jean when her mother-in-law, Charlotte, abdicated in 1964. The relationship between Joséphine-Charlotte and her own daughter-in-law, Maria Teresa, was notoriously difficult. We see lots of the current female sovereigns and consorts sharing their tiaras with their daughters and daughters-in-law — this was not the case with this tiara and Joséphine-Charlotte and Maria Teresa. Joséphine-Charlotte continued to wear this tiara almost exclusively until her death in 2005, although she did lend it to another daughter-in-law, Princess Sibilla, on more than one occasion. After Joséphine-Charlotte died, the tiara almost left the family for good. 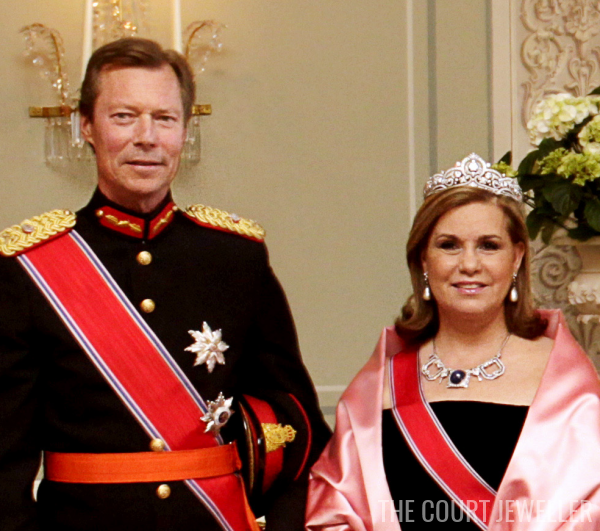 The Nassaus planned to sell a good deal of the late grand duchess’s jewelry collection, including this tiara. 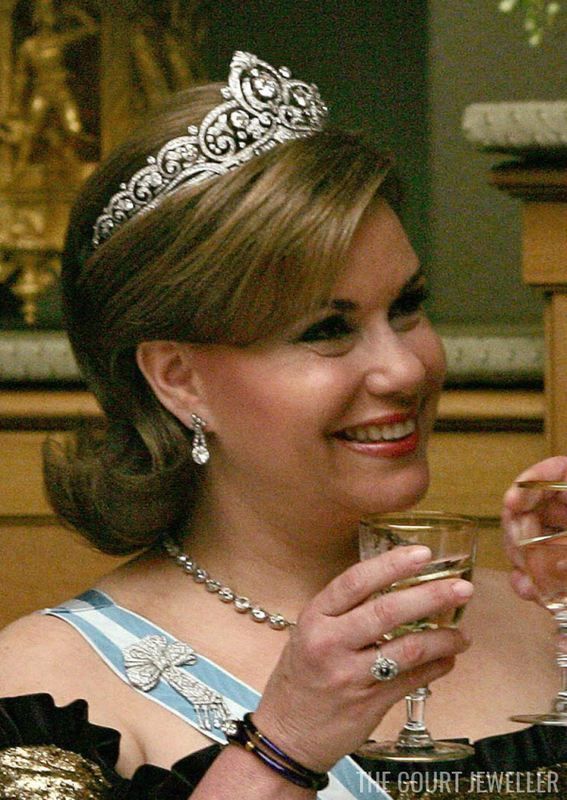 However, public outcry led to the cancellation of the sale, and this tiara was kept in the family’s vaults. (Sadly, other pieces did end up on the auction block eventually.) 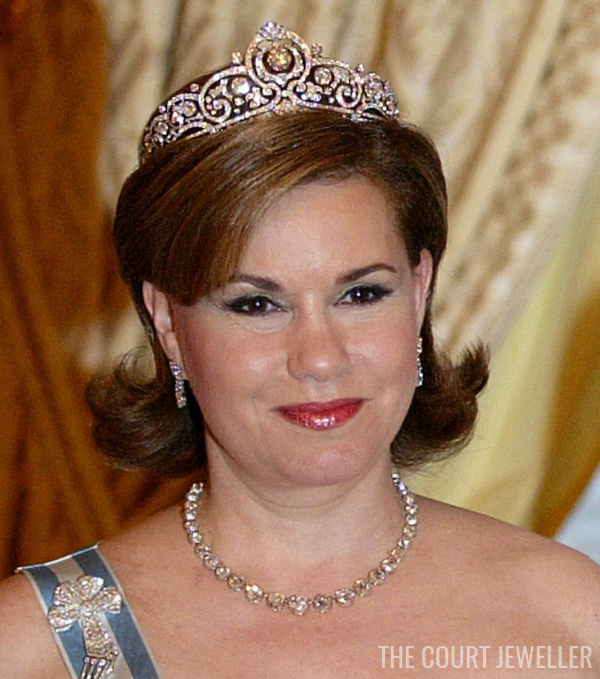 Today, Maria Teresa wears the tiara occasionally, especially during state visits.